Effectively resolving conflict prevents violence, reduces incidents, improves productivity, and contributes to the overall health of an organization. Unlike the traditionally reactive law enforcement approach to resolving conflict, Conflict Management for Security Professionals provides a proven, reliable, business-focused approach that teaches security personnel to diffuse situations before they escalate when dealing with uncooperative, dangerous, or violent individuals. 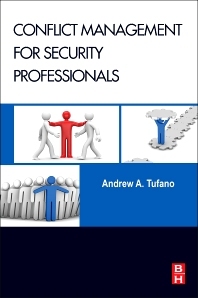 Covering everything from policies and procedures to security tactics and business impact, Conflict Management for Security Professionals uniquely addresses conflict resolution from a security perspective for managers, policy makers, security officials, or anyone else who interacts with people every day. This book helps organizations create and maintain safe environments without interfering with their ability to remain profitable, competitive, and relevant. Comprehensive and systematic conflict management and resolution program geared specifically for the needs of security managers, supervisors, and officers. Incorporates classroom and field-tested conflict resolution concepts, models, and approaches. Addresses everything from policies and programs to tactics for a wide variety of stakeholders in any private or public organization. Corporate security directors and managers, law enforcement officers, organizational security and safety policymakers, risk managers, security consultants, security management college students, security officer supervisors, and other security staff. How Can Conflict Resolution Be Incorporated into Organizational Policies? Andy Tufano has worked in the security industry since 1977. He holds a master’s degree from California State University at Fullerton. Over the past 25 years, Andrew has held various positions in the security industry including: uniformed security officer, loss prevention investigator, security company owner (PPO), security trainer, and security consultant. Andy has major clients in the healthcare and college campus industries. He holds various security industry weapons instructor and end-user certifications such as baton, firearm, and Taser. He is an active member of the International Association for Healthcare Security & Safety (IAHSS). Andy has created several business ventures including Goldstar Security LLC, Goldstar Tactical Training, and The Force Decisions Institute. He is also a prolific writer and has been a featured speaker at ASIS and IHASS events. Andy is a recognized subject matter expert (SME) in private person use-of-force. Andrew is an experienced college educator and currently teaches at a public southern California college.